Keats’ Letter to George and Georgiana Keats 1819: ‘There is that sort of fire in it which must take hold of people in some way – give them either pleasant or unpleasant sensation.’ Identify the pleasant and the unpleasant in Lamia. Keats also wrote: ‘the poetical Character itself … has no self – it is everything and nothing … [and that he] has as much delight in conceiving an Iago as an Imogen.’ Apollonius and Lamia are dramatic creations in Keats’ dialectic: identify the ‘everything’ and the ‘nothing’ in these two. For detailed notes on the poem, read my annotated text. Hermes: astronomical/heavenly imagery: ‘star of Lethe’, ‘bright planet’, has ‘serpent rod’. He grants love aspirations. Lamia also has astronomical/heavenly imagery: ‘silver moons’, ‘mooned body’s grace, stars’, starry crown’. She also grants ‘love’ aspirations. Lamia seems a ‘lady elf …or the demon’s self’. She promises to separate bliss from pain I 192/6. ‘All charms’. She is a ‘foul dream’. But Lamia desires a mortal. Moon imagery links her with Cynthia/Phoebe/Diana: sister of Phoebus/Apollo is part of Apollo’s fire-world). Lamia as a serpent also suggests Satan. 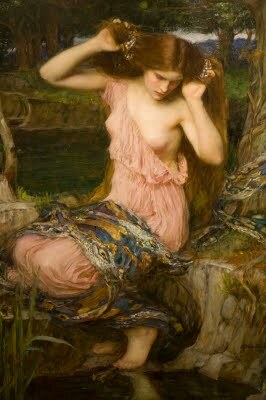 Lamia is mocked in Hermes’ ‘beauteous wreath’. Lycius is a hoodwink’d dreamer, falling in love with Lamia who has ‘elfin blood’ and lingers by the wayside ‘faerily’, with whom he lives in a magical palace with a ‘faery roof’ I 147, 200; II 31 123. Identify where Lamia is portrayed as an immortal serpent-woman with some of the properties of Hermes. Find examples of Lycius lacking ‘spine’. Note (a) the negative traits and (b) the dignity of Apollonius. Select one of the viewpoints below and argue its the relative merits. Leigh Hunt: Triumph of thought over feeling, feeling over imagination. Lamia has a soul of humanity. She is not a mathematical truth. Some critics view the poem as a satirical denunciation of philosophy (or rationalism). David Perkins: no heroes/villains, showing Keats’ ambivalence. The poem is about the consequences of being a dreamer.